In order to promote their new doll house, an international toy manufacturer needed to be able to display it – and its components – at big box retailers. 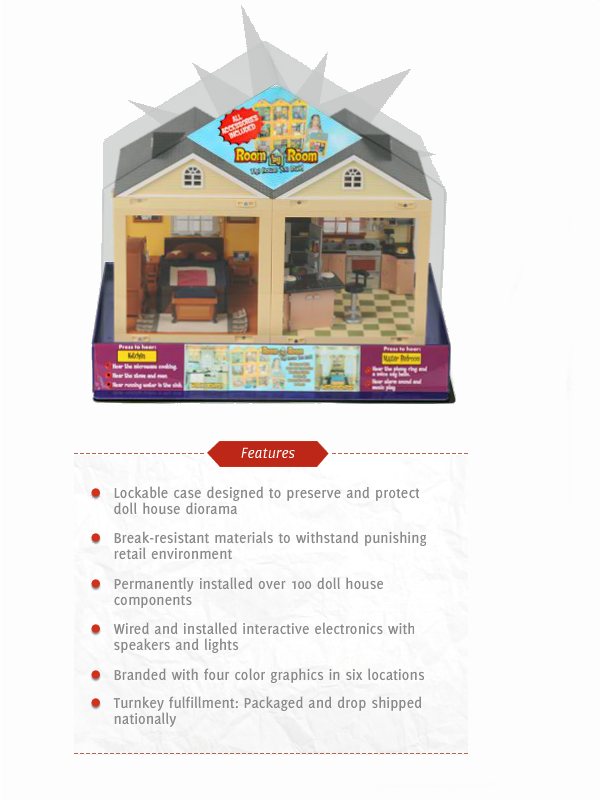 Because the manufacturer needed to ensure that all parts of the display would remain permanently in place without getting damaged by customers, employees or in transit, they were looking for a clear display case with a color-matched base to encase and protect the doll house. In addition, they wanted a company like Braeside to install all of the doll house’s interactive electronics, speakers and wiring, as well as assemble more than 100 components from three different sources. Once finished, these doll houses needed to be packaged and drop shipped nationally. Braeside filled that tall order. Braeside’s creative, manufacturing and project management team worked together to determine how to best manage all aspects of this highly complex project while ensuring they met the client’s aggressive timeframe. They had to coordinate and test more than 100 separate display elements from three suppliers to confirm that all the parts worked properly. Braeside installed the electronics using cushioning materials to ensure the electrical components would withstand abusive shipping and retail conditions. Since the display was battery operated, the team developed a concealed access door with a Velcro latch to provide a simple economic way to access the battery. Various glues were tested for cure time and bonding strength to find the best way to permanently assemble the doll houses so they would remain attractive in stores. Braeside then engineered a case and a base that would showcase the product and withstand the abuse of a retail environment. Braeside exceeded the client’s expectations with its attention to detail, display case design, and ability to provide a full-service turnkey solution.